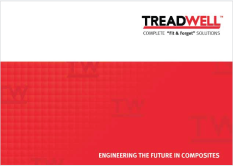 At Treadwell, we believe that the Fibreglass Reinforced Plastic (FRP) sector is poised for evolution into new and previously uncharted territories, where its many benefits will provide a return on investment previously unequalled by homogeneous products or metallic alternatives and leave a smaller footprint on our environment. Since the 1990s, we have been applying excellence in engineering and design to achieve time and cost saving solutions for clients across an extensive scope of industries. Our expertise has expanded to offer complete structural and walkway solutions which are now present in water and waste water treatment, marine and shipping, public infrastructure, and mining and minerals sectors to name only a few. We are constantly working to maintain our lead in the competitive FRP products industry. By persistently providing you with novel solutions in FRP, we have committed ourselves to helping you avoid the unnecessary challenges that are evident by using more primitive alternatives. With this level of engagement, we actively seek ways in how our FRP products and systems can be applied to save you cost and time to remain the ‘Innovators in FRP Technology’. We continually seek to cultivate a strong culture of originality and ingenuity so that we can always implement complete "fit & forget" solutions anywhere. To be at the forefront of shaping mindsets and economies with the comprehensive performance and efficiency of composite product solutions globally. We are committed to provide long term solutions and maintenance cost savings to all of our customers, regardless of size or industry. With these compelling principles guiding us every step of the way to excellence, we can help corporations and individuals like you to develop and flourish. • Major official search for alternative offerings to expand the company began.